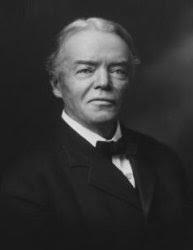 Pictured is Josiah Royce, who was born in a mining camp in California, attended and taught at the University of California, Berkeley, and who then spent the bulk of his career at Harvard University as a colleague to William James and George Santayana. Royce’s early work is associated with Idealism, but he was influenced greatly by the Pragmatism of William James and Charles Peirce. The later works of Royce, with a focus on interpretation and community, are now recognized as significant contributions to Pragmatism and the history of philosophy. I thought that the idea that we must now, amidst our difficulties, demonstrate "loyalty" to California was one of the most important things that Governor Brown said, though no one has particularly commented on the observation, at least as far as I have seen. The call by Governor Brown is to place our commitment to the "we" above our commitment to our individual advancement and gain. I think our ability to deal with our budget and other challenges successfully will be determined by whether we can, in fact, do exactly that.